This is going to be the best “very special episode of” ever. Who doesn’t love a good crossover? You know, like Ray Romano showing up on King of Queens. The doctors from St. Regis having a drink at Cheers. Granny from the Beverly Hillbillies appearing on Mister Ed. I guess that was on my mind lately. 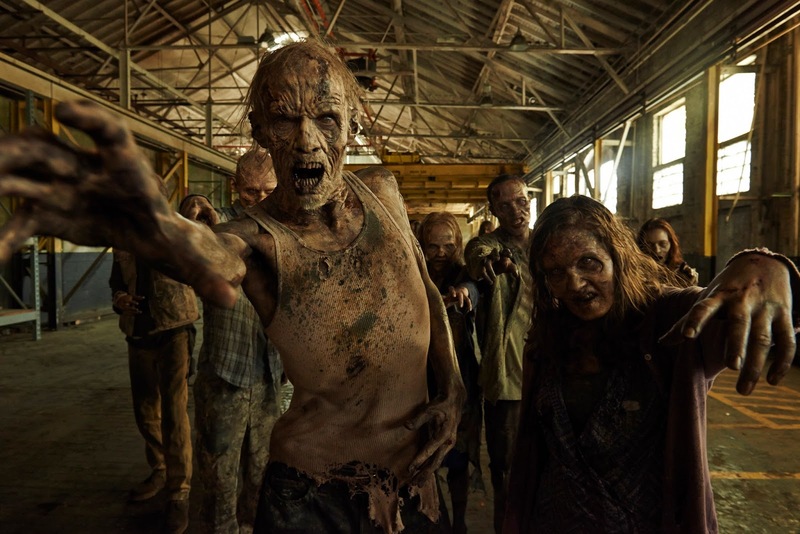 I was wondering – as many have – if there was any way to connect the cast of The Walking Dead with the spinoff show Fear the Walking Dead (I recap both shows for the WSJ, as you can see here and here, so I tend to think about them quite a bit.) The former is set in Georgia, and the latter in Los Angeles, and in case you don’t know, the trains aren’t running. So having these two groups of apocalypse survivors meet is pretty unlikely, but not impossible. Maybe it would have something to do with the cast of Z Nation? After all, they’re in the same zombie boat, and trying to get from the east coast to California. Then it occurred to me that there are a bunch of shows I watch that could conceivably be crossed over. Besides the three zombie shows, I also like Mr. Robot, Orphan Black, and Humans. Could there be a way to write one story that combines characters from all those shows? Just for fun, as a sort of as a writer’s exercise, I tried to dream up a way to do it. It all tumbled together quickly. Within an hour had the outline of one story that connects every show I follow on a regular basis. Essentially, it’s this: A hacker society knocks out power across the country, which releases deadly rats from a genetics lab that spread a zombie plague. The only way to stop it is for the scientists at the lab to get back the one man who is immune, but he’s clear across the country. You can see where it’s going if you watch the shows. What’s more, it works out in a way that is actually pretty organic. It connects several completely separate shows (well, sort of completely separate) and doesn’t violate the internal logic of any of them, I think, taking only minor liberties. I even figured out a way to get a Rick and Morty cameo in there. I love the idea of all these different characters meeting and interacting. Rick Grimes and Eliot Alderson. Sarah Manning and Mattie Clark. Michonne and Helena. Niska and 10K. Daryl and Warren. Alicia and Cosima. Strand and Rachel Duncan. Plus, as an added bonus, this story explains how the zombie apocalypse started. That’s something the Dead shows don’t do. I’ll probably never find the free time to write it, though, so I figured I’d lay out the basics here. I’m calling it Omnitalus, the Latin words for “all” and “tales.” I don’t know if that really works as a title, but I think it sounds sort of cool. Elliot Alderson and fsociety (Mr. Robot) finally come up with a way to infiltrate the corporate intranet of Evil Corp. and take it down. What they don’t know, though, is that one division of Evil Corp. is called Dyad. Both Dyad (Orphan Black) and Evil Corp. are really controlled by the shadowy group called Topside (Orphan Black), an amorphous cabal of powerful people and organizations. One of their obsessions is genetics and cloning. Dyad has a lab in California, where they are working on endeavors related to their top-secret cloning project, Project Leda (Orphan Black). Several of the existing clones have exhibited amazing powers of recovery. One, Helena, was shot point blank and recovered. The daughter of another clone was hit by a car and survived and recovered. Dyad is trying to isolate and replicate the DNA that allows their clones to survive death. The project is led by Cosima Niehaus. But they are failing. They isolated the DNA involved, but a test serum used on lab rats has failed: the rats are injected, and then killed. They come back to life, but they don’t come back fully. They seem in fact only half alive, brain-dead, and unusually aggressive to boot. Cosima is ready to give up, to destroy the specimens, to destroy the compounds. Then fsociety strikes. The attack shuts down Evil Corp.’s entire network; every single facility is compromised, including Dyad’s California lab. The attack actually causes a nationwide power failure. The rats, infected, dead-but-alive, are sitting in their cages, cages controlled by the lab’s computer system. When the power goes off, the latches click open. The sound attracts the rats’ attention – since all they respond to is very basic stimuli. They slowly crawl out of their cages. They escape, and start wandering around the lab. In the confusion, several dead-alive rats make it all the way out of the lab, and begin wandering around in the desert, moving in whatever direction they hear sounds. Soon one is heading to a rave on the outskirts of Los Angeles. Some drugged-out partiers have staked out an abandoned warehouse, where they have a wild party/marketplace, a sort of Burning Man/Wal-Mart, where everything is available and everybody is whacked out. The dead-alive rat bites more than one stoner before somebody finally crushes in its skull. One of the stoners the rat bit was a girl named Gloria, (Fear the Walking Dead) who runs with a crowd of heroin freaks that use an abandoned church in LA as their drug den. Before long, the zombie plague is inside the city limits. It spreads fast. Before anybody understands what is really happening, Los Angeles is a dead city, as is the entire nation. Society has collapsed. The majority of the people in the orbit of Project Leda (Orphan Black), end up making it to the California Lab. This is Sarah Manning, and Helena, Allison Hendrix and everybody else (it would be more realistic if they all didn’t, and if Robert Kirkman was writing this story, he’d definitely kill off a few; I’m feeling a bit more sentimental about them right now though). On their way, they run into a fleeing Clark/Manawa and Salazar families, including Strand (Fear), and the whole motley assortment makes its way to the lab. The Dyad scientists, led by Cosima and Rachel Duncan, are still trying to find a cure within their DNA. While they failed with the Leda clones’ DNA, they hope for better results with another line of clones, the Castor clones. There is one Castor clone that Topside is trying to bring to California: Murphy (Z Nation). Murphy has slipped from the group that was transporting him, but Topside had him RFID-chipped so he’s traceable. They send a team to find him: Sarah Manning and Helena. Maddie Clark insists on going, too, and is included. To get them over to the east coast, the girls are outfitted with a solar-paneled SUV (hey, Dyad’s got it all) and a special driver: another Dyad project, a “synth” android (Humans) named Niska. The four have a long, fraught trek across the country. You can imagine the mayhem and fighting they have to go through, and more than one lecherous scavenger will rue the day they crossed paths with Niska and Helena. Admittedly, at this point, I don’t really have B-plot for the Fear or Orphan Black cast left at the lab. I’ll have to work on that. Guess I could have them fighting off some herd or something. The members of fsociety have survived by holing up in their Coney Island hideout, and have even figured out their own solution to the zombie plague: a ray-gun of sorts that emits a low-level electromagnetic pulse that is just severe enough to scramble zombie brains but leaves the living unharmed (I have no idea if a weapon like this is even remotely feasible, but it doesn’t seem all that unreasonable really). Armed with this technology, they begin clearing a path out of the city. During this operation, Elliot sees two men running down a street, an old man in a lab coat and little boy (Rick and Morty), who are arguing and bickering. “Rick, all I wanted was some help with my diorama, you’ve destroyed the world,” Morty, the kid, says. “If you’re happy settling for C+ plus, that’s your problem,” Rick, the old man, says. “How could you tell?” Rick says. He fires his own ray gun, and they disappear into some kind of worm hole, after which Elliot is sure he’s gone completely insane. After fsociety gets out of the city, they head down to Washington, D.C., intent on wiping out the zombies – and instilling their own version of a perfect society. Meanwhile, Murphy has stumbled into Alexandria’s wall. Rick Grimes won’t let him in, distrusting the odd-looking stranger. Then Warren, Doc, 10K, and Addy arrive, tailed by a herd of zombies, and they’re let in, including Murphy. Murphy goes outside and clears the herd single-handedly, exhibiting his amazing power to control them. Sarah, Helena, Maddie, and Niska follow Murphy’s signal there. There they meet the Grimes clan, and everybody else, and explain that they need Murphy, and why. Warren doesn’t want to give him up to these strangers, no matter who they say they are working with. Meanwhile, fsociety shows up. There is a great friction; fsociety wants to take over the (surviving) world, but Rick Grimes is not about to have any of it. Meanwhile, Sarah just wants to grab Murphy and split, but he’s in no mood to be taken to California. Rick isn’t about to let fsociety just take his town, but Eliot isn’t about to bow down to some sheriff’s deputy. However, before the squabbling factions reach blows, there is a new threat from outside: Negan. This forces all of them, the Grimes clan, the Alexandrians, fsociety, Murphy and the Z Nationers, Sarah and the Leda team, to band together to fight off Negan and his marauders.